Continuous improvement is a process, so it has steps and activities. And roles and responsibilities. And it has performance indicators. if the average time it takes to realize an improvement is 3 weeks (cycle time is 3 weeks) there will be a backlog. if less or equal than 2 weeks there will be no backlog. 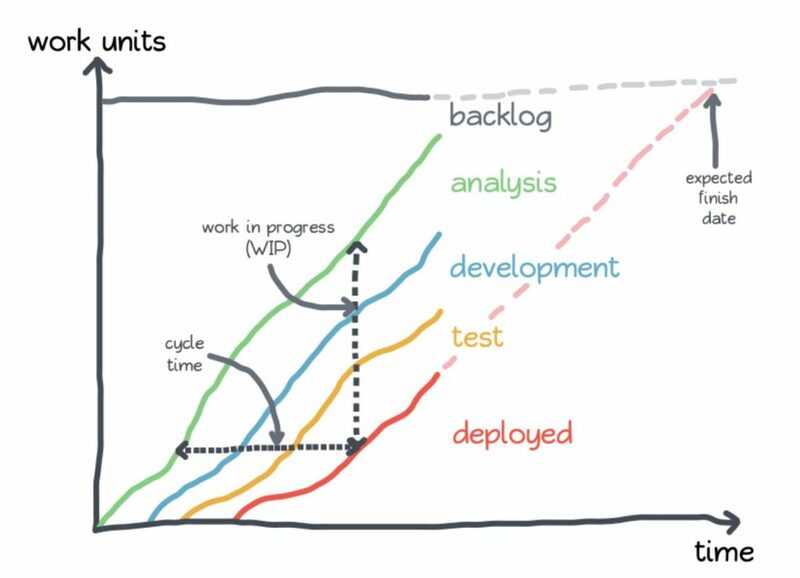 In Lean the term backlog is called WIP (Work in progress). These performance indicators can be used to set-up the cumulative flow diagram as shown in this picture. Setting up this diagram is a good. The use of this diagram we will explain in the rest of this post. What happens when your capacity to realize improvement suggestions is not sufficient to realize an improvement in 2 weeks. WIP will increase and this will be visible in your cumulative flow diagram. Or when someone in your team is leaving and a new teammember is lacking crucial skills? Or when the takt time is not 2 weeks but 1 week (i.e. every week a new improvement suggestion is submitted (because of changes in customer demands, legislation or competition).